Surprise! There’s yet another new SUV/Crossover available to help quench a seemingly insatiable consumer market. Yes, it’s fairly amazing that manufacturers cannot build and sell these smaller cargo carriers fast enough. But, ignore what the public craves and well, good luck. Meaning, you cannot just throw any vehicle chum into the water and expect drivers to react in a feeding frenzy. There’s too much good competition to phone it in. 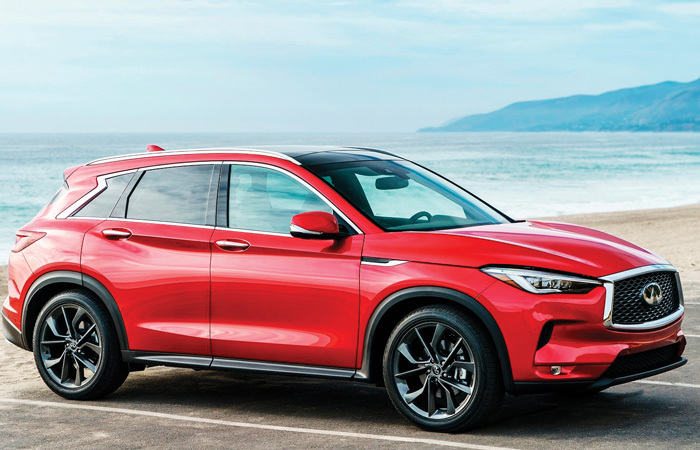 Infiniti knows this and has unveiled the 2019 QX50; an eye-catching, tech laden improvement to the outgoing model with a first-ever production powertrain that we’ll delve into later. It’s the 3rd largest vehicle in the Infiniti class behind the QX80 and QX60 but larger than the newish QX30. The bottom line is the QX50 is an excellent candidate in a crowded compact field. How so? Let’s take a peek. The QX50’s exterior provides a terrific balance of attractive chops to smile at when walking up but not so crazy that you have to talk yourself into liking it. Let’s call it handsome (chiseled even) with some worthy trim accents without trying too hard. It possesses the unmistakable Infiniti sporty front fascia and drew cool responses of “dashing” without screaming, “Look at me!” Our Majestic White tester casts (for a SUV) a sleek, muscular stance enhanced by Infiniti’s signature “double wave design.” I was impressed with the graceful extended character lines along its flanks, offering a perfect proportion from stem to stern. It’s robust without looking bulbous. The fit and finish is impressive too, offering some of the tightest seams of any production car I’ve seen. The furrowed LED eyebrows over the bright LED headlights and accompanied sporty air vents give the QX50 a slightly sinister personality. Attractive optional 20” carbon-colored rims fill the wheel wells nicely without causing an overly bumpy ride. Dual chrome exhausts and lowered roof rails enhances the appealing package. The QX50 possesses the world’s first production variable-compression-ratio-four-cylinder (VC-T for Variable Compression, Turbocharged) engine. Why is this important? Well, the engine can change its compression and even the displacement (!) and took 20-years to design. Simply put, this can maximize efficiency whether you’re puttering down a side street or flooring the pedal heading to an onramp. All that hoopla makes one believe it will get about 100mpg. Uh, no. But it’s best in its class compared with Turbo-four-cylinders SUVs squeezing 24/31 in FWD or 23/30 in AWD—some 35% better than the outgoing QX50 on premium fuel. The engine feels less “rubber bandy” than other CVT options with zero gear changing. It sounds more like a turbine, yet the acceleration is noticeable. Its plenty perky for a four-banger going 0-60 in 6.4 seconds—quick enough for most family wagons. As one reviewer aptly said, “It’s a soft launcher but once underway, wakes up rather quickly.” Horsepower and torque numbers are respectable for a four-cylinder 268hp/280 lb.ft. Throw it in Sport mode and it’ll jump for you. I’d stay away from ECO mode as it deadens the throttle. Braking is smooth and confident. The Drive by Wire steering works in this model as it feels direct and responsive. The suspension soaked up bumps well without feeling mushy—no small feat and you can take long trips without feeling fatigue. Infiniti threw all their design ingenuity into the plush interior as it feels more expensive than the sticker. Bravo! It provides an upscale, quiet cocoon that drivers and passengers alike will appreciate. Exquisite dash and door designs mirror the exterior’s graceful flow with contrasting double stitched leather. Lighted Infiniti kick plates are a nice touch. 8-way power front seats allow a higher sit and commanding presence. Remote start is standard. While the standard fare is worthy, the options definitely contribute. Check the $7,500 Sensory Package and receive a bounty of heated/cooled seats, Ultrasuede headliner and trim, Natural Maple Wood trim, Bose Performance Series 16 speakers and heated steering wheel. They’re all worth it. A double-pane panoramic roof adds a spacious feel to the cabin. The sporty leather steering wheel is adorned with volume, menu, voice activation and cruise control buttons. The brushed aluminum trim contrasts nicely with the leather interior. Storage is ample for your various knickknacks. Back seat room is generous in this class and the seats fold down (optional) for extra cargo space. However, room for your feet underneath the seats in the back is surprisingly cramped. Dual-touch screens fill the center console; a large NAV screen complete with traffic and speed limit notifications on top and an infotainment display for radio etc. underneath. Infiniti sweats the details, as the delightfully organized analog control buttons and knobs are a breeze to navigate, although there is no designated radio-tuning knob. Cargo space is worthy at 31.4 cubic feet of available room with a full golf bag fitting horizontally. Drop the rear seats (with convenient levers) and the room expands to 64.4 cubes that’ll hold a whole bunch of stuff. A handy motion-activated power lift/trunk lid and low shelf make it easy to load and unload cargo. Infiniti continues to impress the finicky techno-lover. Like most in its class, the QX50 offers optional safety protectors to where you’d have to be a deplorable driver to wreck this ride. The beneficial ProActive package ($2,000) is the highest option available for Tech and Safety. Included are Head-Up Display (but no speed limit signs), Lane Departure Warning/Prevention, Blind-Spot Intervention, Direct Adaptive Steering and High Beam Assist. The ProAssist option ($550) delivers Intelligent Cruise Control, Adaptive Cruise Control and Backup Collision Intervention. You can select points of interest (all the golf courses were listed) and restaurants by Zagat ratings. The NAV, XM Real-Time Weather, 36 radio presets (across all radio formats! ), Backup Camera, and Voice Recognition are excellent. In addition, you get the 24-hour access to Infiniti Connection that’s like conversing with your very own concierge—all at the push of a button. Very luxurious. The 2019 Infiniti QX50 is a handsome, well-appointed, tech-laden step up from the outgoing QX50 design. It will surely lure current Infiniti owners and countless new customers interested in delving into the compact luxury SUV/Crossover market. All at a price point that feels like a bargain when compared to other expensive choices. I believe you’ll be duly impressed when getting behind the latest in the Infiniti fleet. Test-drive the 2019 Infiniti QX50 at Crest Infiniti in Frisco.